The railway-carriage manufacturer Södertelge Verkstäder (SW) had started an aircraft department in 1913 and licence-built French Farman aircraft. The German designer Forssman was engaged by SW to develop own designs. His first project was the fighter SW 15. One machine was ordered in 1917 by the Swedish Aeronautical Society. SAS had collected the necessary money through a lottery, with the aircraft as first price. Therefore the nickname ”Lotterijagaren” (”the Lottery Fighter”). Due to a fatal crash during the trial flights, the contract with SAS was cancelled. However, the aircraft was repaired and sold to the Army Aviation Company . Further two aircraft were ordered by the Army, but this orders were stopped after the bad results of the trials with the first SW 15. In the end the two remaining SW 15:s still were supplied to the Army. SW laid down the aircraft department 1917 and sold their remaining stock to the Army to a reasonable cost. The SW 15 was fitted by a 110 hp Scania-Vabis engine (Mercedes license). The aircraft had bad manners and was hard to fly, probably due to bad design. However, the SW 15 delivered something useful. It was with this type experiments was made that led to a Swedish designed device for firing a machine-gun through a rotating propeller. 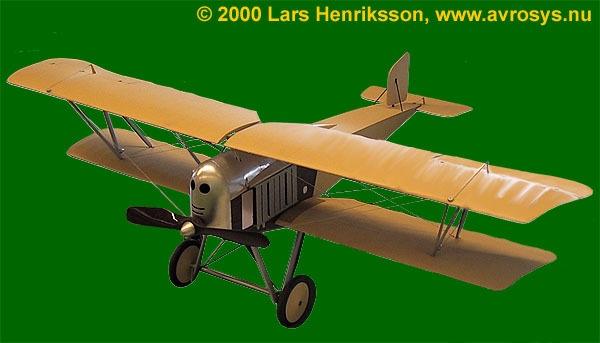 Model from Flygvapenmuseum (Swedish Air Force Museum). The model, in scale 1:6 is built by Mikael Carlson. Length: 5,90 m. Span: 8,26 m. Maximum take-off weight: 640 kg. Max. speed: 125 km/h. During the First World War, the neutral Sweden got very little information about the rapid progress of the aviation technology in the surrounding world. It stood soon clear both for the Swedish military authorities and the managements of the two new Swedish aircraft manufacturers, Thulin (AETA) and Södertelge Verkstäder, that it was necessary to develop own fighter aircraft designs with own recources. Thulin had through their license agreements with French aircraft and aircraft engine manufacturers got a valuable know-how. For example, the Thulin K aircraft was a development of the license-built Morane-Saulnier. They had also started manufacturing of rotating engines of Le Rhône’s design. But one important detail for military aircraft was missing – the armament. Södertelge Verkstäder lacked much of Thulin’s experiences. Here comes the story about Södertelge Verkstäder and the SW 15 fighter, also called “the Lottery Fighter”. The SW 15 was manufactured by Södertelge Verkstäder, abbreviated “SW”, about 35 km south of Stockholm. SW was since the start in 1897 a large manufacturer of railway cars and other railway equipment. In 1913, an aviation department , aviatikavdelningen” was established. The already legendary aviation pioneer Carl Cederström (1867-1918) was recruited as chief for the new department. Cederström, also an experienced businessman, had good contacts in France. SW started its aviation activities with the marketing of French-built aircraft (Farman) and Gnome-Rhône engines. After some time, SW began to produce licence-built aircraft. Another industy in Södertälje, Scania-Vabis, began to build German aircraft engines on licence. Carl Cederström had, trough his large network, got contact with the Swedish-German engineer Villehad Forssman (1884-1944). The latter was to design two aircraft on behalf of Södertelge Verkstäder, one pursuit aircraft for a 100 hp Mercedes engine and one reconnaissance aircraft (two-seat) for a 150 hp Benz. Forssman had delivered the general drawings, but hardly anything more. As it was impossible to get any more information from Forssman (perhaps due to the risning great war), Cederström decided to let SW continue the work with the two aircraft themselves. The civil engineer Henry Kjellson (1891-1962), later one of the best and most famous Swedish aviation designers, led the design work. In 1916 Cederström left SW and Gösta von Porat (1886-1972), an experienced army aviator and also aircraft builder became the new chief of the Aviation Department at SW. But Kjellson was young and unexperienced at this time. The whole thing resulted in a terrible back-lash. The SW 15 was a one-seat biplane design with the lower wing attached to the fuselage. The upper wing was supported by struts from the fuselage and the lower wing. The welded steel tube fuselage was covered with plywood panels around the cockpit and forward. The aft part of the fuselage as well as wings and tail was fabric-covered. The engine top and front had aluminium cowlings. The aircraft was fitted with a 100 hp Mercedes D.I engine, licence-built by Scania-Vabis. The engine was a six-cylinder, water cooled, inline type that was developed in 1913. It was used on many German aircraft during the first part of the World War I. The coolers for the engine were fitted on the sides of the fuselage. The first built SW 15, with the army aviation number 825, had some dangerous points. The upper wing was mounted forward to the lower in an extremely way. The aircraft had no stabilizing fin forward of the side rudder. The wheels were placed too far backwards, so the aircraft would easy turn over. Lieutenant Bertil de Maré, one of the most skilled aviators of the Army Aviation Company, was engaged by Södertelge Verkstäder to make the test flights of SW 15. The tests took place at the military airfield at Malmen. The aircraft had a very high landing speed. This fact, together with the extremely staggered wings and the wheels placed in a dangerous was, made in very risky to make a traditional wheel landing. The aircraft could easly stand on its nose. If de Maré had made a three-point landing, no problems would not possibly occur. But he preferred to make a wheel landing with the tail high up in the air. The accident was a fact, de Maré turned upside down with his aircraft. He broke his neck and died immediately. De Maré was born in 1884 and became Lieutenant in 1916. He got his eductation as an aviator at Enoch Thulin flying school at Ljungbyhed. Aircraft 825 was repaired. The Aviation Lottery refused to take delivery of the aircraft. Some changes were made in the design. The landing wheels were moved forward. A new tail with fin forward of the rudder was built. Also some minor changes were done. Further two SW 15’s were build, number 827 and 829. These were, together with 825, donated to the Army Aviation Company from Svenska Kvinnors Försvarsförbund (The Defence Society of Swedish Women). In 1917, Södertelge Verkstäder was incorporated in Svenska Maskinverken. The inventories of aviatikavdelningen , including a few complete aircraft, was sold to Enoch Thulin in Landskrona. The fabric that covered most part of the aircraft was treated with dope (laquer). This treatment tautened and stretched the fabric. The dope had often slight yellow-brown tint. This tint got stronger and stronger the more the aircraft was exposed for sun and rain. The wood parts were probably treated with some kind of varnish. The aircraft had the national insigna Three Crowns painted in black on six places: on the fuselage and on top and underside of the wings. It is impossible to give any exact sizes etc. The aircraft number was painted forward of the crown mark on the fuselage. See the illustration. SAS or Svenska Aeronautiska Sällskapet (The Swedish Aeronatic Society) tried in 1914 to arrange a lottery to support the Swedish aviation industry. Several similar lotteries had been arranged in other European countries. But the Government said no. First in November1916 it changed its mind and SAS arranged its first (and last) lottery in 1917. 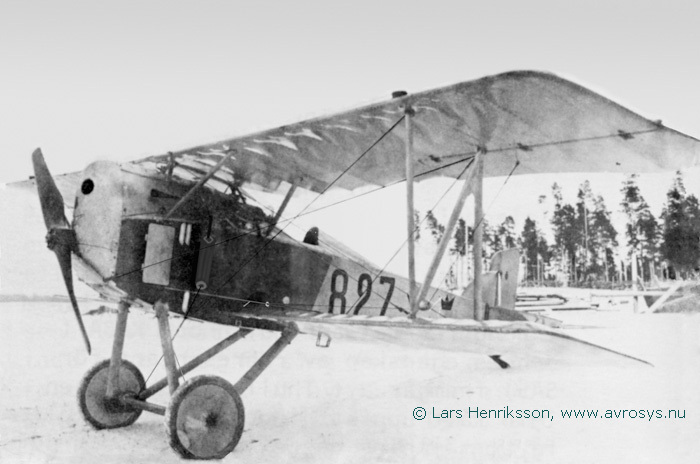 1st price: “An aeroplane from Södertelge Verkstäder with a 100 hp Merecedes engine manufactured by Scania Vabis useable as a military aircraft (pursuit) or tourist & sport aircraft.” Worth 28.500 kronor. 2nd price: “A collection of exquisite antique furniture.” 8.000 kronor. 3rd price: “A summer house of three rooms and kitchen with veranda”. 4000 kronor. 4th price: “A 30 square meters archipelago cruiser” (large sailing boat). 3.500 kronor. And a large number of other prizes. The aircraft that constituted the first price, a SW 15, crashed on its trials. Flyglotteriet put in a claim for the aircraft. The winner got its value in money – a large sum in 1917. Flyghistorisk Revy Nr 22 – Flygkompaniets flygmaskiner. Stockholm 1972. Flyghistorisk Revy Nr 26 – Kring ett flygvapens tillblivelse. Stockholm 1976. Flyghistoriskt Månadsblad Nr 4 1983. Stockholm 1983. Svensk Flyghistorisk Tidskrift nr 1 2008. Stockholm 2008. ISSN 1100-9837. KSAK, Svenskt flyg och dess män. Stockholm 1940.